It’s not often that the origins of two seemingly unrelated entities coincide in a way that allow for an exchange of creative inspiration and collaborative endeavors. Stewart Christie’s beginnings are rooted in the same period of the Jacobite Rebellions, around which the new Starz series Outlander centers. To celebrate this common history, it is our pleasure to invite one of the stars of this new historical fiction into our esteemed tailoring firm to enjoy a piece of Scottish heritage off-screen, and demonstrate the cultural significance of the two institutions coming together. 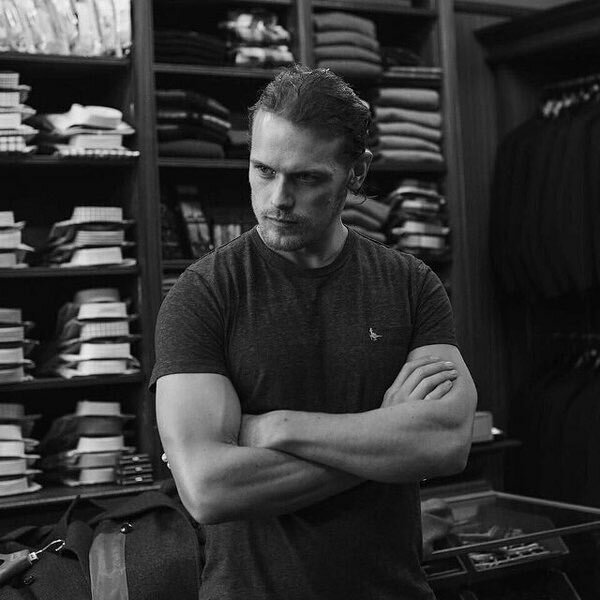 Sam Heughan sits down with us to give a bit of insight into his experience playing Jamie Fraser and what it means for him as a Scotsman to bring to life a part of Scottish history integral to the country’s present day culture. 1. What is the most rewarding part about playing the character of Jamie Fraser as a Scotsman? This role has been a real "homecoming" for me. I was born and brought up in rural Scotland, but I left for over 14 years. Now I’ve been able to rediscover my childhood/ancestry and fall in love with my home country again whilst being able to bring the things I love about it to an international audience. 2. Outlander being historical fiction, what do you think is the most relatable part of the show to the modern viewer? Outlander lets the viewer have access to a world that is familiar, yet undiscovered. We imagine ourselves, like Claire (the main character), going back in time. How would we cope? What would we do? It's pure escapism that’s based in a very real historic period. 3. Since Jamie finds himself in Edinburgh at several points in the series, just around the time Stewart Christie was founded, what do you think your character would have commissioned from us? I've discovered a lot about the history of the kilt and of tartan; its origins, and how it became fashionable. Ultimately, for Jamie, it's a practical piece of clothing, a warrior’s utility belt, so to speak, serving a variety of purposes. I think he'd go to Stewart Christie for something finer, a quality suit, to change into after roaming the highlands! 4. Playing off of that last question, what was your favorite costume to wear during filming? 5. Thinking about Stewart Christie’s attention to each customer’s individuality, how would you describe your personal style? I'm definitely developing a taste for quality, gentleman's clothing. Anything that is well made, from durable, yet luxury materials. It's subtle, but I think it makes a huge difference to the way one feels when wearing it. Plus, people respond well to a well-dressed man! Ha! 6. Twelve yards of fabric can be tricky to handle, but can you tie your own kilt? Absolutely. It's an interesting process (especially in a small enclosed space) - laying out the fabric and folding pleats, then laying down to tie it around the waist. It's part of a ritual, and one that warriors and highlanders share. 7. Considering that Outlander is largely filmed in Scotland, have you ever found yourself on location at a place you’ve visited, or think of fondly, having grown up in Scotland? This has happened many times. Recently we shot around Drumlanrig Castle in Dumfrieshire, which has many ties to the subject matter (the Jacobites having stayed there etc). Plus, I was brought up nearby and had visited as a child. It's such a gift to be able to bring that to a role: the history and sense memory of a place. 8. Aside from the history found in the textiles and fashion portrayed in the show, Outlander’ script features much of the Gaelic language. Have you picked up any particular words or phrases that you think should find their way back into the modern Scottish lexicon? There are many words we use in Scottish English that have Gaelic roots. I love to look at place names in Scotland, see their Gaelic or Norse roots, and realize what a diverse and ever-changing country we live in. Gaelic names, once translated, reveal a hidden meaning or detail. Mountains, Lochs, people etc. 9. Playing Jamie Fraser, you’ve had the unique opportunity to experience firsthand (at least in some respect) Scottish life in the 18th century. What do you think has changed most? Technology, warmth and roads. We've become soft. They were hardy people and probably didn't live long! 10. Finally, what are you most excited about for the future of Outlander? We are finishing filming season two, dealing with Culloden, Bonnie Prince Charlie and major Scottish history. It's terrific! I’m excited to see how it's received and whether we do another season.